Commonly known as Pleomele or Song of India, this is one of the more decorative types of Dracaena that is grown indoors. Whorls of yellow-banded green leaves spiral upright, reaching about 3 ft (90 cm) tall. Its compact form and slow growth make it an ideal room accent. Give a young plant a boost by placing it on a pedestal plant stand. Those upright rosettes of colorful leaves will look spectacular. Care is easy. This Dracaena thrives in average room conditions, even tolerating dry indoor air. 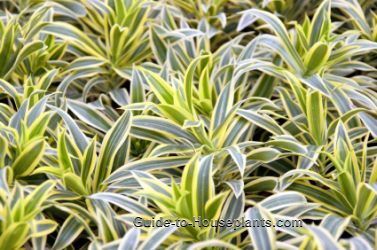 It will survive in low light, but you'll get the best leaf color and growth by keeping this tropical in bright light year-round. Just don't overwater. Soggy soil will cause stems to become soft and mushy at the soil level. Upright leaves tend to be dust-catchers. Set your plant in the shower and gently spray the leaves with tepid water. Or wipe them off with a damp cloth. Repot in spring when roots become coiled in the container or grow out of the drainage holes. Always use fresh potting mix when you repot a plant. It even shrugs off pests, although dry air may attract spider mites to its leaves. Regular misting with water will do double-duty, raising the humidity and keeping those pests away. Light: Bright indirect sunlight. You'll get the best leaf color in bright light, but keep the plant out of direct sunlight which can cause brown scorch marks on leaves. Water: Keep soil lightly moist spring through fall, slightly drier in winter. Do not let soil get waterlogged, which can cause root rot. 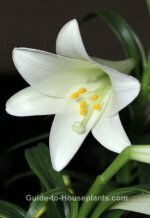 Always use room-temperature water for your indoor plants. Humidity: Average room (around 40% relative humidity). Dry air may cause leaf tips to turn brown; there are easy way to raise the humidity for house plants. Temperature: Normal room temps (65-75°F/18-24°C) will suit this plant. This plant tolerates hot better than cold; do not expose it to temperatures below 50°F/10°C. Even cold drafts near a door or window will harm it. Soil: Good-quality, all-purpose potting mix. Fertilizer: Feed every 2 weeks in spring and summer with a 10-10-10 liquid fertilizer diluted by half. Propagation: Take 3-4 inch (8-10 cm) stem tip cuttings in spring. Pot 3 in the same container for a fuller effect. Cuttings are easy to root in moist sterile potting mix.